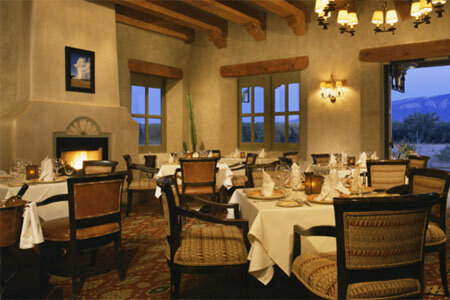 An elegant dining destination on the Santa Ana Pueblo. : Honoring its setting on the Santa Ana Pueblo without hamming it up, this resort restaurant stands a pioneer on Albuquerque’s burgeoning fine dining scene. With giant picture windows and an exhibition kitchen to enliven the serene, Southwestern-themed dining room, it specializes in tableside rotisserie service --- a seasonal prix-fixe feast centered around the likes of spiced and marinated buffalo, duck breast, chorizo and jumbo shrimp. But lovely surprises abound on the à la carte menu as well, from blue corn-crusted quail in chipotle-bacon gravy to roasted root-vegetable terrine with toasted pine nuts and port-apple jam. Desserts are equally inventive and elegant; candied lemon and mint ice cream garnish a blueberry clafouti here, while red chile adds kick to a chilled slice of chocolate marquise there. The wine list isn’t quite as extensive or diverse as one might expect for a restaurant of this caliber, but it’s sprinkled with its share of charming finds.